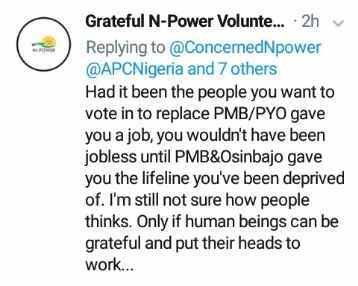 So there was this constructive argument between Concerned Npower Volunteers and Grateful N-Power Volunteers on Twitter which triggered N-Power to react to the situation. The conversation started when concerned Npower Volunteers make a statement concerning permanency. Below is what unfold. So, Grateful N-Power Volunteers were not OK with Concerned Npower Volunteers statement and they reacted. 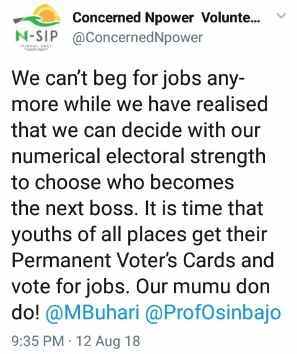 Had it been the people you want to vote in to replace PMB/PYO gave you a job, you wouldn't have been jobless until PMB & Osinbajo gave you the lifeline you've been deprived of. I'm still not sure how people thinks. Only if human beings can be grateful and put their heads to work. This argument between these two parties captured Npower Attention and they came in to quench the fire. So, they wrote. Again, let us state CATEGORICALLY that this programme will NOT be blackmailed. As a Nigerian, you are free to vote whoever you please. It is your constitutional right. Have yourself a good evening. 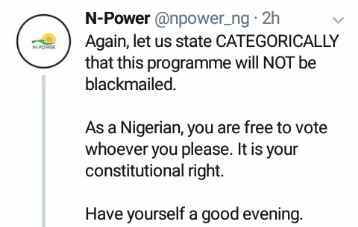 If you are not following N-Power on Twitter then you must be missing out on some presiding.